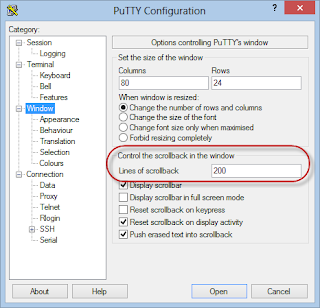 In the PuTTY configuration window, select Window in the category tree on the left. 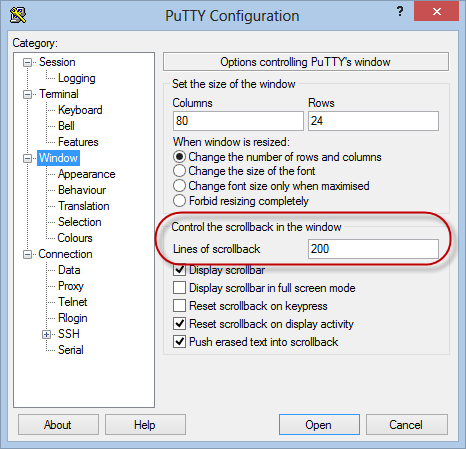 Change the Lines of scrollback to whatever value you wish. The default is 200. Some people set it as high as 5000. If you'd like to make the new setting the default, select Session in the category tree, in the Saved Sessions window, type Default Settings, and click Save. Visit my bookstore at www.soundtraining.net/bookstore. Also, check out my video channel at www.soundtraining.net/videos. Thanks for the fix. It worked great.